SPARKS!’ marketing communications services include Web, Video, Social Media and Internet Marketing solutions designed to help our Customers connect with their Customers. We will help you to CREATE your message, craft your brand and develop content that SPARKS! your audience. Communications now cross multiple platforms, and we are ready to capture your story to share on the web, print, video and traditional mediums. Advertising channels are evolving fast. Digital Marketing includes Web and Mobile Development, Search Marketing, Search Engine Optimization (SEO), Video, Social Media – who know what will be next? 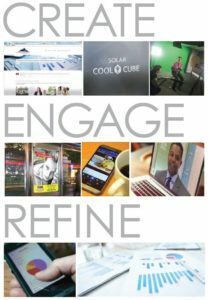 This is our daily focus: to develop and manage these resources to deliver your message, facilitate dialog and ENGAGE your audience. But these elements don’t just work alone, and we like to keep score! Using Analytics and Performance Measurement tools, we REFINE the process to reach your audience and maximize your Marketing ROI.